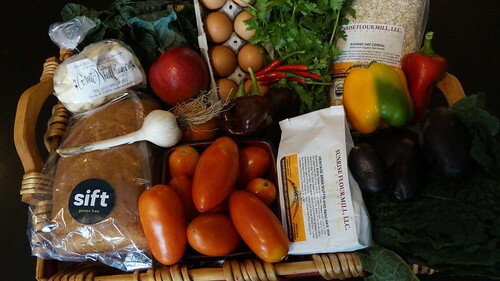 Shopping Basket from the September 1 Mill City Farmers Market - Mill City Farmers Market 2018 - Minneapolis Riverfront Neighborhoods. New in the basket this week: Majestic Purple potatoes from Burning River Farm, bread from Sift Gluten Free, chocolate peppers for Urban Roots, and Heritage Bran Muffin and Pancake Mix from Sunrise Flour Mill (which is currently in the "Beta" phase and being tested by a few various customers - I'm looking forward to using it in Labor Day pancakes! ).